Name one stadium in college football where you will see a motorcycle ride across the field! If you guessed Autzen Stadium you are correct! Noted as being one of the most intimidating venues in college football by The Sporting News, each game starts with the Oregon Duck mascot leading the Oregon Ducks onto the field on the back of a roaring Harley Davidson. 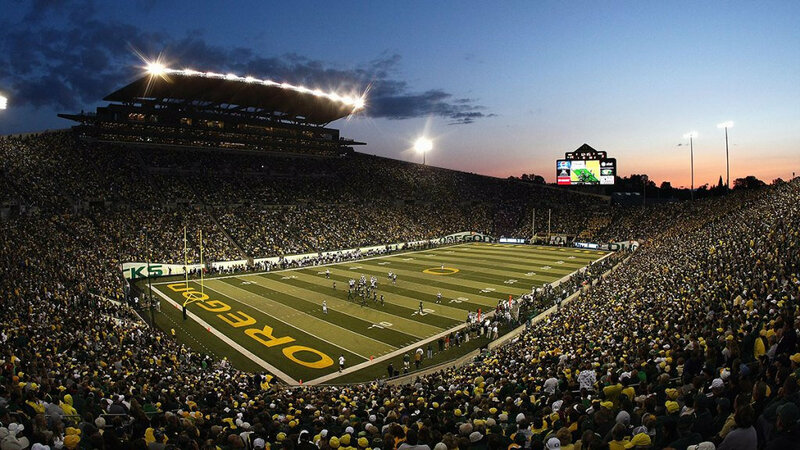 The Oregon Ducks have called Autzen Stadium their home for almost a half a century. From 1919 until 1967, the Oregon Ducks played at the 15,000 seat Hayward Field. By the 1960s as the football team became more successful, it was apparent that a new stadium needed to be built for the Ducks. Oregon athletic director, Leo Harris, along with Thomas J. Autzen, whom the stadium was named after, spearheaded the project by giving the school $250,000 toward construction costs for a new facility. By the 1967 season, the $2.5 million Autzen Stadium was completed and had a capacity of about 41,000. The Ducks played their first game at Autzen Stadium on September 23, 1967, a loss against Colorado. Although the stadium originally had a grass field, it was replaced with AstroTurf before the 1969 season. Until 2002, Autzen Stadium underwent few renovations. In 1982, the Barkers Stadium Club was added at the east end zone of the stadium. A three story building on the north side of the stadium containing 381 club seats and 12 luxury seats was constructed in 1989. A new press box was also built prior to the 1989 season. Before the start of the 2002 season, 12,000 seats were added to the south rim of the stadium. Also included in this addition was the expansion of the press box that included 32 luxury suites. This addition provided a cantilevered roof to cover some fans from inclement weather. The latest addition to Autzen Stadium was installed in 2008, a 33′ x 85′ HD video/scoreboard, nicknamed DuckVision. Today, the stadium has a capacity of 54,000 today. Not only is Autzen Stadium known as on one of the most intimidating college football stadiums with its high volume crowd noise it also has one of college football’s most popular mascots, the Oregon Duck.